Baaghi 2 3rd Tuesday (19th Day) Box Office Collection. Solid. Baaghi 2 is staying solid in 3rd week and thus film is on verge of touching 160 crore mark. Film has hold extremely well on 3rd Monday and 3rd Tuesday. Drop on 3rd Monday from 3rd Friday is just around 30%. Drop on 3rd Tuesday is further 10% from 3rd Monday. 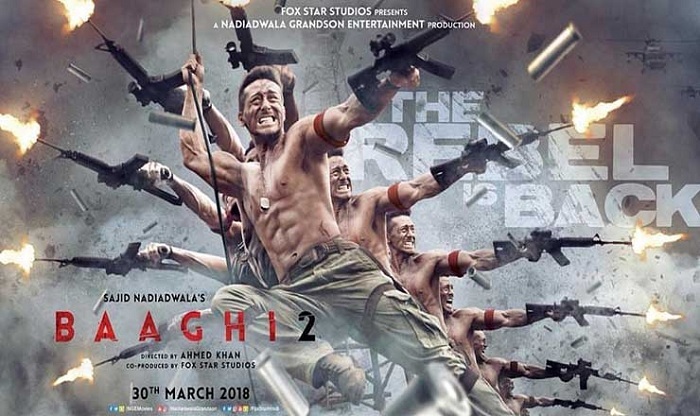 Baaghi 2 has added an approx 2.25 crore nett on Day 18 and Day 19 combined. Thus, film has collected an approx 9.45 crore nett in 5 days of week three. Film total business after 19 days is approx 157.9 crore nett. Film will cross 159 crore nett before the end of 3rd week and will be just shy of 160 mark. Baaghi 2 will continue to dominate atleast in single screens in coming week. Film will touch 165 crore nett in its theatrical run in India and still has an outside chance of touching 170 crore mark. Fri to Sun -> 7.2 crore nett. Mon + Tue -> 2.25 crore nett (est). Total -> 157.9 crore nett (approx).